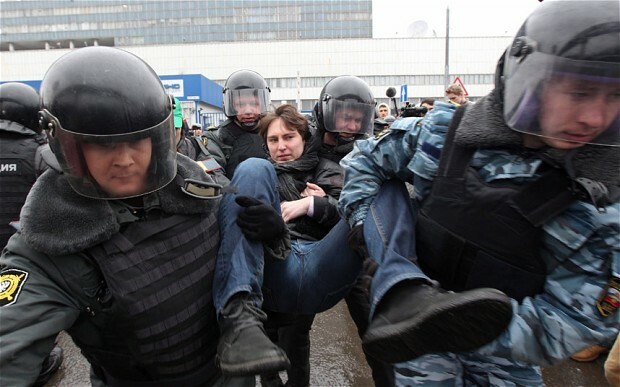 Russian police arrested nearly 100 people on Sunday for picketing Moscow’s TV tower over footage that accused the opposition of paying anti-government protesters. On Sunday, after more than 150 protesters carrying signs calling for nonviolence and the rule of law began to chant the slogan that has echoed throughout the Arab revolts — “The people want the fall of the regime” — uniformed officers and men in plain clothes beat them with sticks and began making arrests. Argentina’s truckers called an indefinite strike on Monday to demand higher pay rates, parking their rigs in protest just as exporters were counting on them to haul freshly harvested soybeans to port. Thirty Palestinian prisoners have joined the hunger strike of Hana Shalabi, who was hospitalized on Monday evening after consuming only water for 33 days. In Cuba, three dozen members of the Ladies in White opposition group were detained on Sunday before their weekly march to press the government to free prisoners jailed for politically motivated crimes. George Clooney was arrested for civil disobedience in Washington on Friday alongside his father Nick and other protesters after a demonstration outside the Sudanese Embassy aimed at drawing attention to the country’s president, Omar al-Bashir, and his government for provoking a humanitarian crisis and blocking food and aid from entering the Nuba Mountains from South Sudan. Some 200 Moroccan women staged an angry protest Saturday outside parliament a week after the suicide of a 16-year-old girl who was forced to marry the man who raped her. The April 6 Youth Movement declared on Saturday the start to an open-ended sit-in in front of Parliament’s offices, in which the group will demand the release of detained member George Ramzy. HI Liz, thanks for leaving the comment! The reason that I decided to present the idea of pursuing a coach is simply to identify another avenue of support that those watching their spouse battle bipolar disorder. Something that I found with traditional counseling is that many traditional counselors, therapists, psychologists, etc do not have the experience necessary to help guide you through the ups and downs of being married to someone bipolar. The counselors that I started seeing did not do a whole lot to encourage me to stay within the marriage. They KNEW the divorce statistics and knew that the odds were stacked against us. I believe that this happened because they did not have first hand experience with the illness themselves and as a result they were unable to support me in my marriage relationship with my husband. Do I think that a marriage or life coach should be a replacement for a traditional therapist? Absolutely not. I firmly believe that if your marriage is crumbling individual counseling is very important in identifying personal developmental areas that each spouse can work on. After these areas are worked on a life coach that has experience with mental illness can help you as you navigate your marriage with your spouse and helping you set boundaries in a positive manner that will help establish your roadmap to take your marriage relationships from where you are now to where you want to be.